The documentary Flory’s Flame we have produced through our nonprofit company JEMGLO is 95% finished, with a first, second, and third draft behind us. It is a story that weaves together music from Flory Jagoda’s Celebration Concert at the Library of Congress last September with clips from a series of interviews with Flory that tell the story of this National Heritage Fellow who has been widely called the “keeper of the flame” of ancient Sephardic musical traditions. The narrative begins in the Jewish community of Spain before the Inquisition and continues in Sarajevo and a small town nearby called Vlasenica, and it moves to Zagreb, Croatia. During World War II, the flight from the Nazis to safety brought Flory to places along the Adriatic Sea in Croatia, then to Italy, and finally to the USA, where her prowess as a composer and performer of the music on which she was raised took off. Missing from the most recent cut of the documentary are clips of visuals that emit the feelings of the places that give important levels of depth to the story. Consequently, a couple of weeks ago director of photography Curt Fissel, our friend serving as associate producer Cathy Lawrence, and I (producer) set out on a b-roll trip to relevant locales in southeast Europe, carving out our own experiences as we captured footage that painted pictures we had imagined from Flory’s telling. With a day left to go, the pieces of the journey are beginning to gel in my mind. 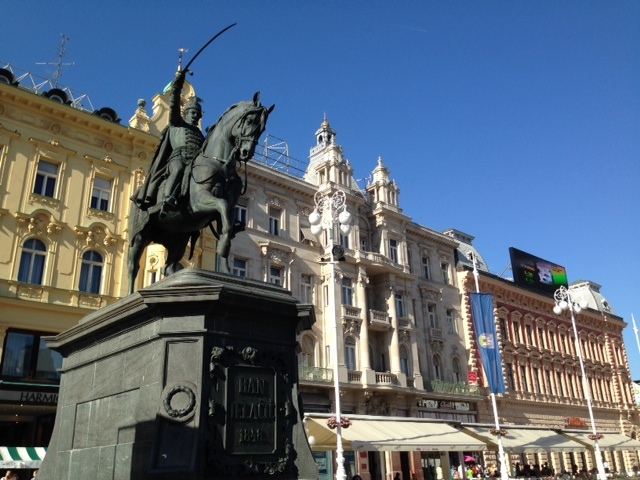 Zagreb: beautiful, colorful, spotless city. 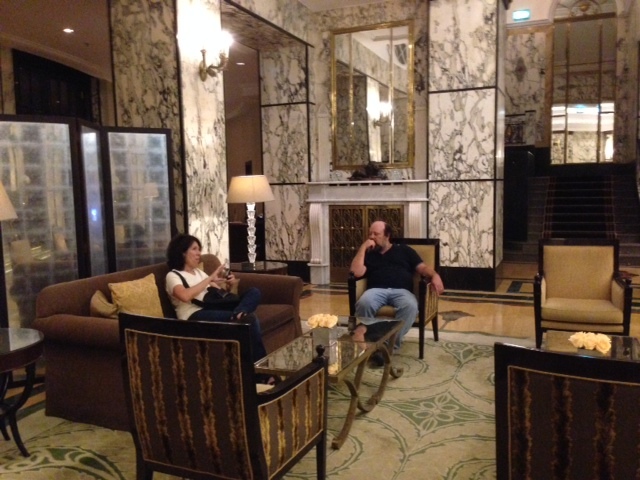 We stayed at the impressive Esplanade Hotel, built in 1925. Once a stop along the Orient Express, the Esplanade retains its grandeur with walls built of marble, crystal chandeliers and the aroma of white lilies wafting through the lobby and adjoining sitting rooms. For dinner we drank delicious, complex Rose wine grown in the nearby Krauthaker vineyards; my very tasty entrée was a plate of pasta with mushrooms and real truffles, also found locally. Curt ate an Adriatic sea bass cooked in a blanket of salt that was peeled after being grilled. The stately Esplanade, located only a few blocks away from where Flory grew up, is a must stay for tourists to this beautiful city. A modern city, we had to work to find apartments and schools that were representative of what Flory might have experienced. But old mixes with new in Zagreb just as our documentary winds story around concert, so we were able to recreate snippets of her teenage years. And the Esplanade gave us the prime room in the hotel with views out the window of the old city – a photographer’s dream. From Zagreb we drove to the Adriatic Coast, stopping first in Split, the city to which Flory and her parents fled when the Germans took over Zagreb. There the local tourism board set us up with the city’s most knowledgeable guide, Dino Ivancic, a history professor who exudes European charm, elegance and a sense of humor. Dino, with whom we shared a wonderful day, brought Flory’s stories alive to us in the context of the history of this gorgeous coastal spot, the site of the palace of the Roman Emperor Diocletian dating to the 3rd century. A ferry brought us the next day to the island of Korcula, about which Flory says: “For us teenagers, it was a good time. No school, go swimming every day, all the time on the beach. …. I became an island accordionist and taught accordion….It made me alive.” In the heart of the ancient stone streets and buildings of the old city, sitting atop a hill that overlooked the transparent turquoise waters of the Adriatic, we could swear we heard the sounds of an accordion belting out harmonies that meshed with its beautiful surroundings. We fell in love with this island filled with friendly people, and we promised ourselves we’d return and stay for awhile sometime after we send our finished documentary out into the world. 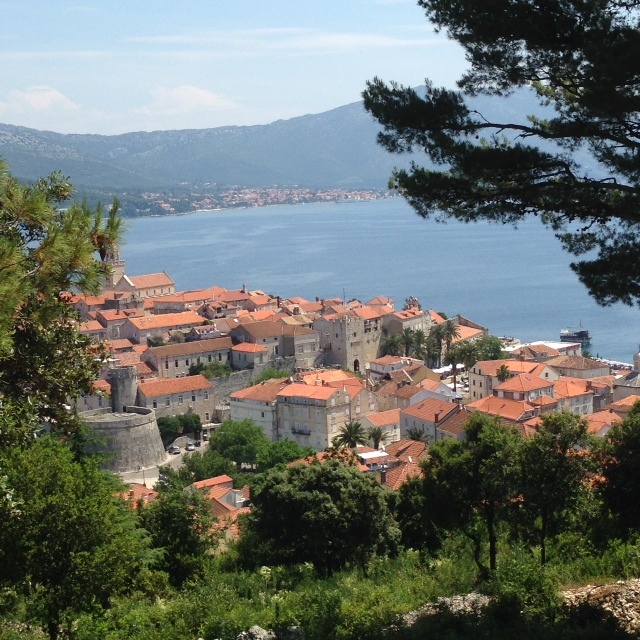 Our chronological route was based on pragmatism, not a mirror of Flory’s timeline, so from Korcula we made our way to Sarajevo in Bosnia and Herzegovina. It was difficult to leave paradise and enter a city still suffering from the aftermath of the siege from 1992-95 in which 9,500 to 14,000 people – half civilians, including 521 children – were killed. Buildings throughout the city are still dotted with bullet holes, and residents readily talk about their experiences and the feeling of fear they have internalized. At a Friday night Shabbat dinner to which we were invited I asked one woman about whether she had hope for the future; she responded by saying there have been four wars in Bosnia in the last century, so how could she envision a time when violence would not raise its head every few decades? It is our last day of filming today, and an historian named Eli Tauber, who is a friend of Flory’s, takes us to Vlasenica, a town that is two hours away and where Flory’s family lived for several hundred years. Appropriately, it is our first full day of rain and fog, shrouding the places of our protagonist’s beautiful childhood memories that the evil history of the Holocaust has fatally destroyed. Tomorrow we close our circuitous road back in Zagreb, where we will meet with the folks who run the Zagreb Jewish Film Festival. Like so many others in this region, they know Flory, love her music, and can’t wait to see the finished documentary. My sentiments exactly! This entry was posted on June 15, 2014 at 6:02 pm and is filed under Documentaries, Flory's Flame. You can follow any responses to this entry through the RSS 2.0 feed. You can leave a response, or trackback from your own site. when will this documentary be available to buy? Thank you for your interest in “Flory’s Flame.” The doc is currently available for community screenings. It should be available for private purchase within the next six months. Please check in occasionally on our website at http://www.florysflamemovie.com or like our FB page: https://www.facebook.com/jemglo, where we will announce when the documentary is available for private sale. Also feel free to contact me at ellen@jemglo.org.